Asheville on Bikes has partnered with Blue Ridge Bicycle Club and AARP to run our first Tactical Urbanism project! Please attend our June 21st launch and public workshop. Who: The Asheville Street Tweaks Team is a group effort between AoB, Blue Ridge Bicycle Club, and Asheville’s AARP, working together to deliver this project. What: Design, install, and track months-long experimental changes to Coxe Ave, to test street design ideas, using a community-driven process for both planning and building. Where: Coxe Avenue from Hilliard going south to Southside. Here is the Google Maps link. How: By rallying the community to design and install a test of better infrastructure, installed with proper permissions from the City. Street Plans and Tony Garcia have been hired to help run this project. They are famously good. Why: Because if we test incremental changes to our streets, we can save money as a city and have better streets that serve all people. We want to demonstrate a fiscally responsible test→evaluate→build approach to street design. 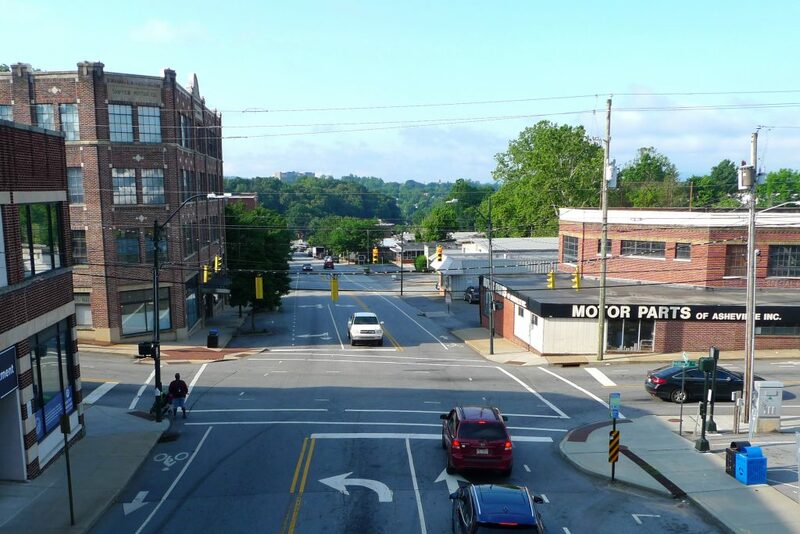 We are coordinating with the City of Asheville, and our test results will directly inform the pending redesign of Coxe Avenue, which is planned in the near future. Important date: Our tactical urbanism street design project begins in Asheville with June 21 public workshop. Please attend. The Workshop is June 21, 6 – 8 PM at 207 Coxe Ave, Asheville Area Arts Council. Please RSVP here. Light refreshments will be served. “The tactical urbanism approach invites participation from all community members through every step of the process,” said Mike Sule, Executive Director of Asheville on Bikes, describing the process of this project. “Not only do citizens provide input on design, they also show up to build it. The process works to empower community to revision and rebuild their infrastructure. It’s an inclusive process that is proven to yield inclusive results. The street transforms to reflect the needs and values of the community.” You can read more from this blog post, What the heck is tactical urbanism? It is the first time the City of Asheville has considered working with community groups to design a long term test of actual infrastructure, outside the scope of their normal street design process. It is the first time Street Plans and Tony Garcia have been hired to work in Asheville. If we listed the top 10 urban design firms in the world, they would be at the top. It is the first time a large section of a City street will be altered for the purpose of gathering data that is then incorporated into a design for the future street. It is the largest project budget-wise that Asheville on Bikes has spun up to date. We are making a big commitment and we are determined to help our City use the process of test/evaluate/build. We are putting our money where our mouth goes, so to speak! This project is a combined effort from AoB, Blue Ridge Bicycle Club, and AARP. We are happy to introduce you to the Asheville Street Tweaks Team and very thankful to be part of a group that is bringing this project to life. We could not deliver this work without the help of Blue Ridge Bicycle Club and Asheville’s AARP – and the combined supporters of all three non-profits. Thank you! Because this project is bigger than Asheville on Bikes, we have created a new entity to describe our group. The “Asheville Street Tweaks Team” is Asheville on Bikes, BRBC, and AARP working together with an outside consultant, Street Plans. This project is not about bikes, per se – it is about getting a good street design from a community-driven process and testing that design before committing to more permanent infrastructure. Come to our first meeting, participate, and you will see your ideas built during this project! We are very excited to have hired a team of outside experts, the Street Plans Collaborative, led by Tony Garcia. Their expertise is vast and on point. By delivering this test project, our partnership is bringing extraordinary resources to Asheville. The Street Plans team will run our June 21st meeting and assist throughout the project. How good are they? Tony Garcia co-authored the book Tactical Urbanism and, with his team at Street Plans, has successfully completed over 100 tactical urbanism projects and assisted in the transformation of more than 50 cities, including his native Miami. Tony’s business partner at Street Plans and book co-author, Mike Lydon, is listed as one of the top 100 urbanists of all time, along with Frederick Law Olmstead and other names you will recognize. Tony spoke in December 2017 at the Building Our City lecture series, sponsored by the Asheville Downtown Association and several other local groups. Mike delivered the keynote talk for the September 2016 Bike Walk Summit, held at UNCA. Asheville on Bikes is determined to learn from the best in the world and we are demonstrating that resolve by working with this wonderful team. When we evaluated locations for our first tactical urbanism project, we approached City staff with our ideas at the very beginning of the project. Our conversations with City staff highlighted Coxe Avenue because of several time-based factors that are unique to it, when compared with the other locations we considered. 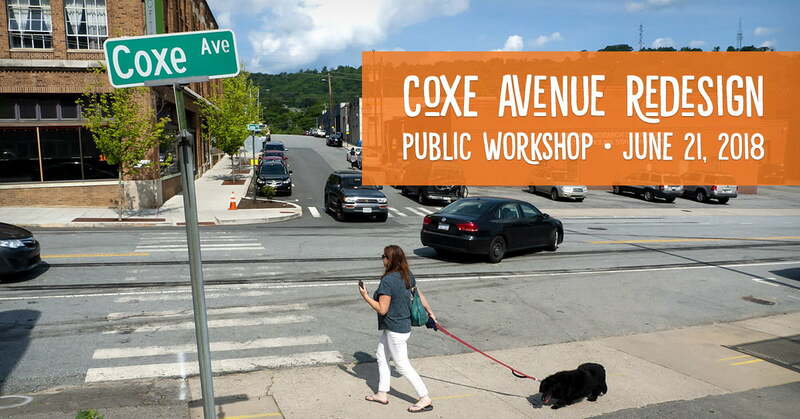 Coxe Avenue is in the middle of a larger planning area, the South Slope, and the Asheville community is already providing feedback to the City for changing the street designs in this area. We benefit by listening to that feedback and coming alongside that process with our test. The City of Asheville Transportation Department has already secured funding for redesigning Coxe Avenue and changes to this street are coming down the pipe. By selecting Coxe for our first project, we get to test ideas that come from the community and feed those test results directly to the City staff who are about to rebuild the street. This means our test can directly affect a street rebuild. Coxe Avenue is in transition to a multi-modal environment. 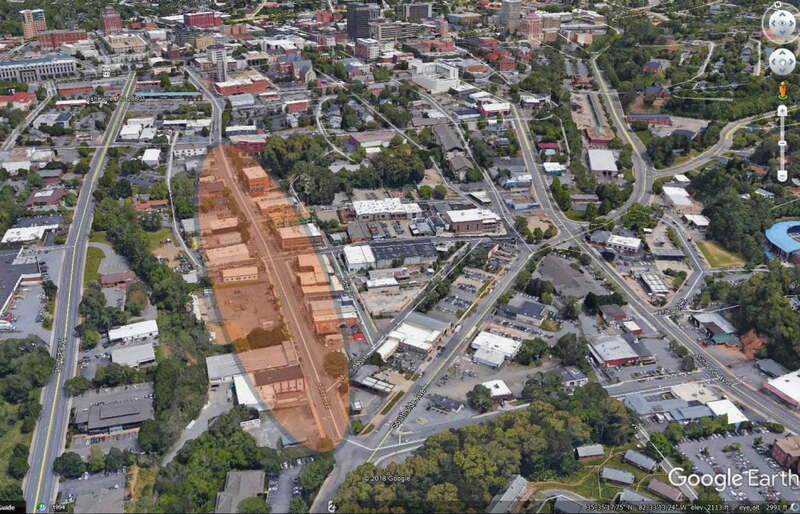 With more residential uses on the South Slope than ever, and more on the way, it is clear that Coxe Avenue is already changing from “Asheville’s first motor mile,” to a more multi-modal environment where people walk, bike, or drive to the businesses on the South Slope. We want to test and find out the best ways to make that easier. You can read more about the history of the South Slope and Coxe Avenue in Pack Library content, “Asheville’s First Motor Mile,” or in the South Slope Visioning website and South Slope survey results. How is the City of Asheville involved? Is this a guerilla project? The City of Asheville is involved in our planning process and has been from the beginning – this is not a guerilla project that is going to pop up in the middle of the night. In fact, as we go through our own planning process, this effort will rise to the level of a City Council vote, where council decides to formally allow our test on Coxe Avenue [Edit: Council voted unanimously in favor on Oct 9, 2018]. At that point the project, if the vote is in favor, will become the first time the City has authorized an outside group to help design and run an ongoing test of an actual changes to a City street! What does this project need in order to be a success? You! RSVP for the workshop here. Conclusion: Why is this a good idea? The process of tactical urbanism enables our city to implement innovative street treatments in a cost effective way while empowering the community to play an active role in transforming the streetscape. Our city is ripe for a tactical urbanism approach.